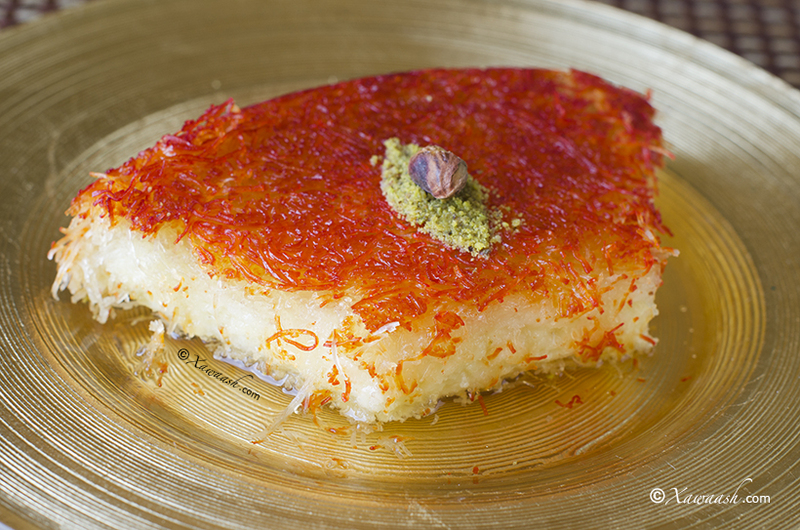 A good kunafa is something special and not everyone does it justice. One of our favourite places to have this dessert is at Paramount Cafe in Mississauga, Ontario. The kunafa is a great ending for a Lebanese meal replete with mezze (a selection of appetizers), manakish (flatbread with toppings), and grilled meats. We always make sure that we leave room for the kunafa. We ask that it be heated a bit in the microwave to make the cheese melt slightly and then add on top the rose water flavoured syrup. With fresh coffee it is fabulous! Last week, while buying the ingredients for kunafa, the lady at the cashier volunteered some tips on preparing it. She said her family and friends tell her that she makes the best kunafa. Her advice was very useful, particularly adding milk to the kataifi, which we found helps reduce the quantity of butter that is normally used. 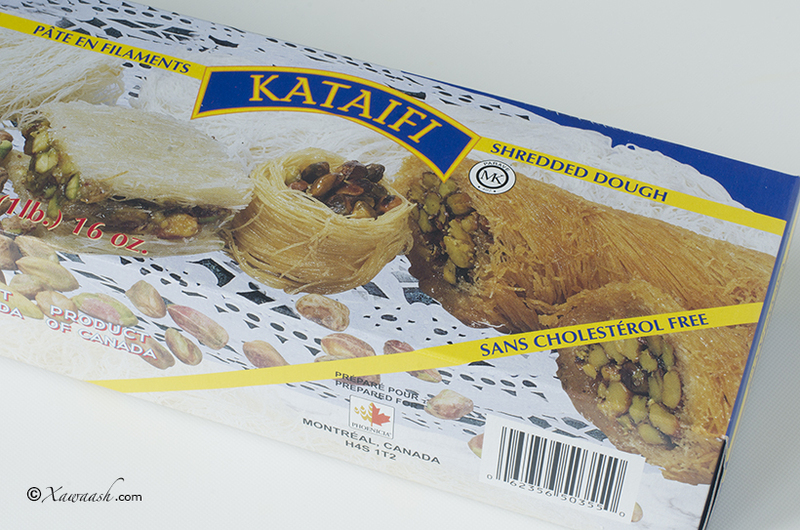 The milk also helps moisten the frozen kataifi dough which is drier than the fresh variety. 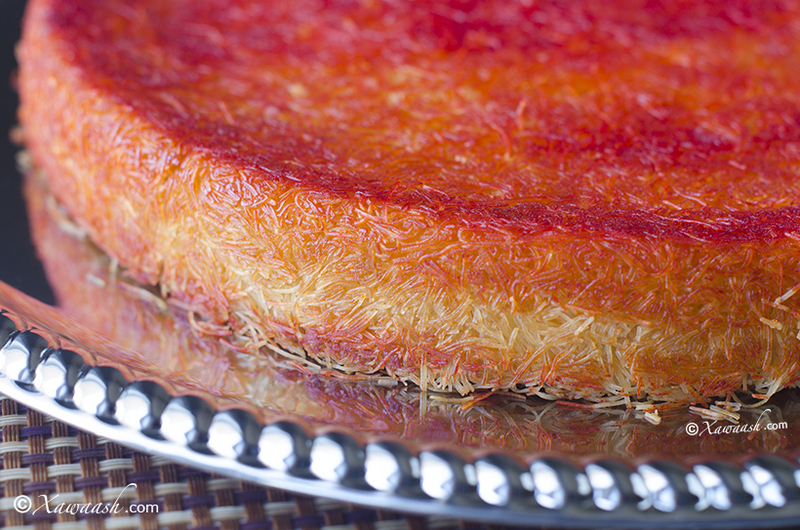 So how does the homemade kunafa compare to the commercial one? Without a shred of a doubt, we can say the one we baked was better. It had everything going for it: the aroma that filled the house, the beautiful orange colour, the warm, stringy cheese, and the priceless reaction of those who tried it. What a delight! Desalt the cheese if salty. 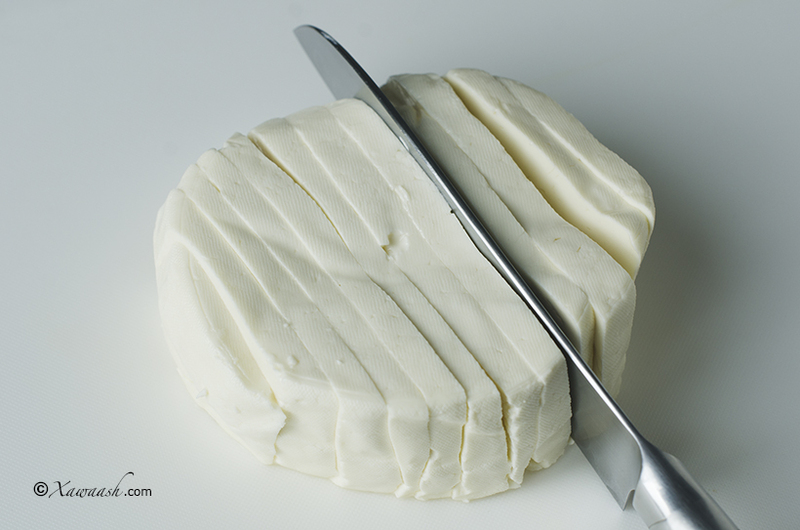 Cut the cheese into 1 inch (2.5 cm) cubes and soak in cold water, in the refrigerator, for 6 hours or overnight. Change the water twice. After soaking, rinse with cold water then drain and pat dry using paper towels. 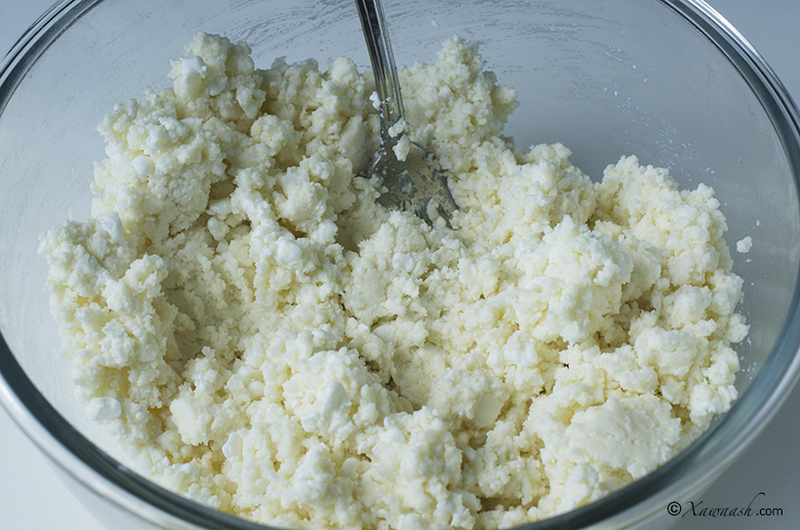 Shred the cheese and combine with the ricotta or cottage cheese. Using medium heat, boil the sugar, water and lemon juice for 10 minutes. Add the rose water after turning off the heat. Let it cool down completely. Butter and colour the bottom and the sides of a 10 in. (25 cm) round, 2 in. deep pan with 1 tablespoon melted butter and ½ teaspoon kunafa pastry colouring. Cut the kataifi dough into 4 equal pieces. Add the milk and lukewarm butter. Make sure that there are no lumps and that the kataifi is fluffy. Place &frac23; of the kataifi in the pan. Press down and along the sides of the pan. 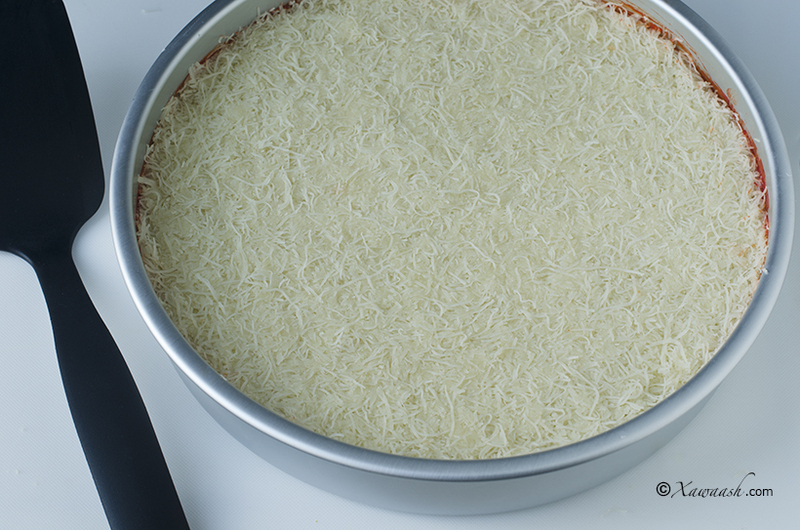 Place all of the cheese. Level and press down. Cover with the remaining &frac13; of the kataifi. Press well with the palms of your hand or use a spatula. Bake in a preheated oven at 350°F/177°C for 40 minutes. 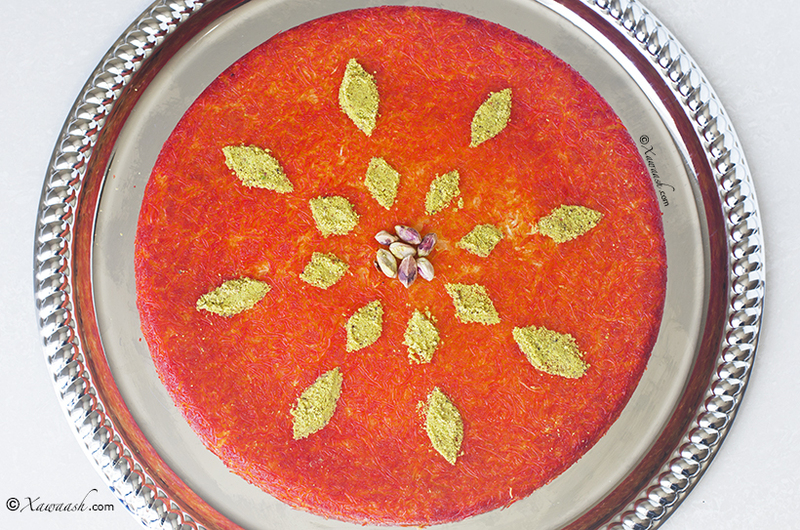 Let the kunafa cool down for 10 minutes before inverting it into a large platter or cake stand. Decorate with ground pistachio. 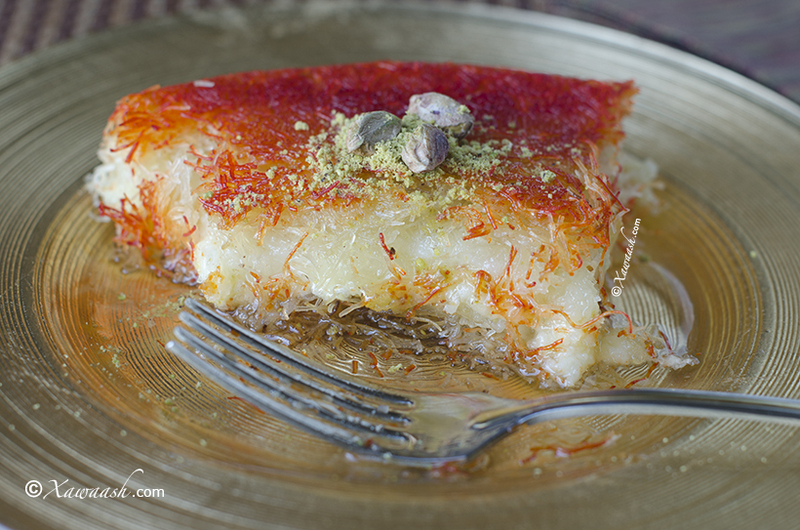 You can pour the cool syrup over the entire kunafa or pour on individual servings. Hadday farmaajada cusbo leedahay, u jar gabalo 1″ (2.5 cm) kaddibna biyo qaboow la dhig muddo 6 saacadood ama ilaa iyo hal habeen, qaboojiyahana geli. Biyaha laba goor ka beddel. Marka aad biyaha la dhigtid kaddib, biyo qaboow raaci, si fiicanna u qallaji adigoo isticmaalaysa xaanshida jikada. Farmaajada burburi kaddibna ku dar farmaajo kotej ama rikoota. Adigoo isticmaalaysa dab dhexdhexaad ah, kari sokorta, biyaha iyo liin dhanaanta la miiray muddo 10 daqiiqo. Dabka ka demi kaddibna ku dar maa’alward. Dhig sirabka ilaa uu si fiican u qaboobo. Bir wareeggeeda yahay 10 in. (25 cm), dhererkeedana yahay 2 in. (5 cm) mari 1 qaaddo weyn (QW) buuro la dhalaaliyey iyo ½ qaaddo yar (qy) midab kunaafo (ama midab oranjo). Si fiican u mari, dhinacyadana gaarsii. Shaciiriyada kunaafada 4 gabal u jar. Caanaha iyo buurada qandaca ah ku dar. Isku qas, cajiinkana fur fur ka dhig. Shaciiriyada marka saddex meel loo qeybiyo, laba meel birta ku shub. Birta ku fidi, dhinacyadana ku dheji. Si fiican hoos u riix adigoo isticmaalaysa calaacashaaada ama qaaddo ballaaran. Farmaajada oo dhan ku shub. Ku fidi, si fiicanna hoos u riix. Shaciiriyada hartay ku shub. Si fiican u riix oo sin. Ku dub foorno la sii kululeeyey 350°F/177°C muddo 40 daqiiqo. Dhig ha qaboowdo muddo 10 daqiiqo, kaddibna ku geddi saxan ka weyn birta aad ku dubtay. Fustuqa ku qurxi. Sirabka kunaafada oo dhan ayaa ku kor shubi kartaa ama qof walba ayaa goonidiisa ugu darsan kara. Une bonne kunafa est un mets spécial et tout le monde ne peut pas le réussir. Notre restaurant préféré pour manger ce dessert est le Café Paramount à Mississauga, Ontario. 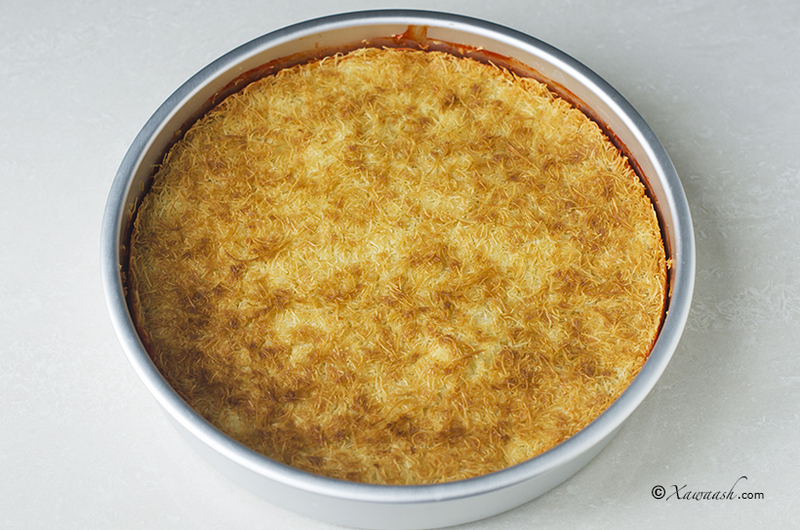 La kunafa est parfait pour terminer un repas Libanais composé de mezze (une sélection d’entrées), de manakish (pain plat avec des garnitures), et de viandes grillées. 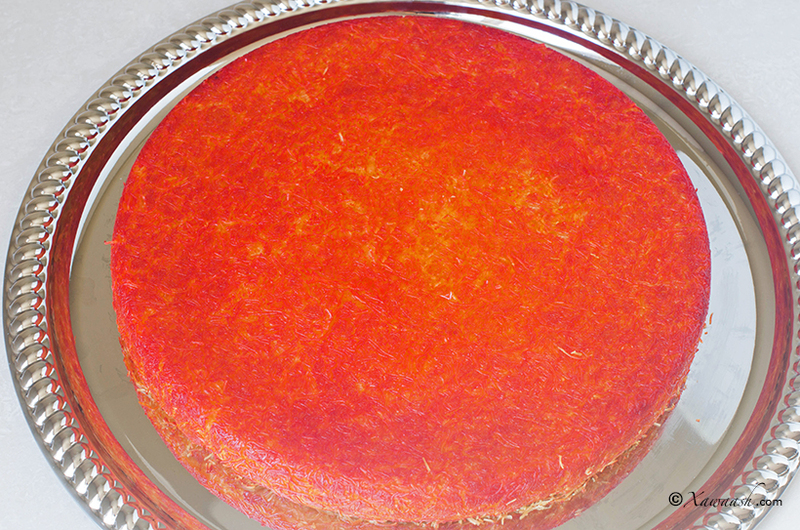 Nous nous assurons toujours de garder un peu de place pour la kunafa. Nous demandons à ce qu’il soit réchauffé au micro-ondes pour que le fromage soit légèrement fondu et d’ajouter un sirop à l’eau de rose dessus. 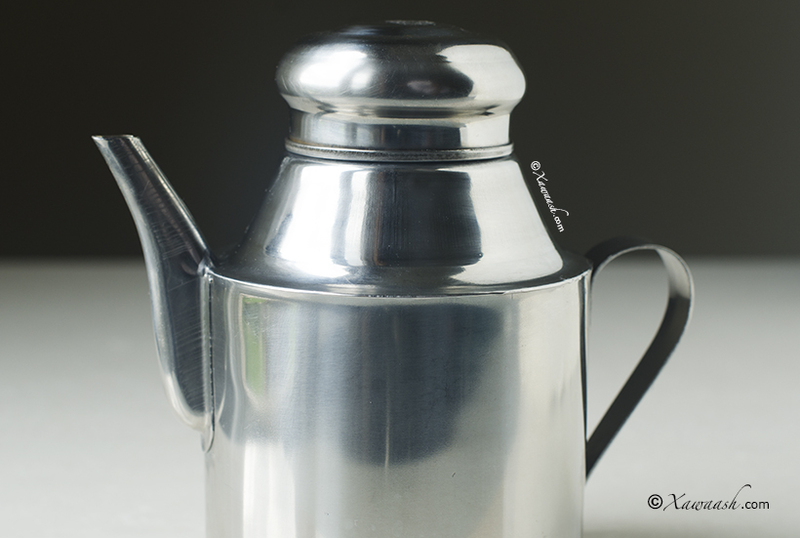 Avec du café frais c’est fabuleux! La semaine dernière, alors que nous achetions les ingrédients de la kunafa, la dame de la caisse nous offrit quelques conseils de préparation. Il nous dit que sa famille et ses amis lui disent toujours qu’elle fait la meilleure kunafa. Ses conseils furent très utiles, particulièrement d’ajouter du lait à la pâte de kataifi, ce qui réduit la quantité de beurre nécessaire. Le lait aide aussi à mouiller la pâte kataifi surgelée qui est plus sèche que la pâte fraîche. Alors cette kunafa maison tient elle la comparaison face à la version commerciale? Sans l’ombre d’un doute, nous pouvons annoncer que celle que nous avons cuisinée était meilleure. Elle avait tout ce qu’il fallait: l’arôme qui remplit la maison, la belle couleur orange, le fromage chaud fondu, et la réaction de ceux qui l’ont goûtée. Quelle délice! Dessaler le fromage s’il est salé. Couper le fromage en cubes d’un pouce (2.5 cm) et laisser tremper dans l’eau, dans le réfrigérateur, pendant 6 heures ou toute une nuit. Changer l’eau deux fois. Après le trempage, rincer à l’eau froide puis égoutter et sécher avec du papier absorbant. Écraser le fromage et mélanger avec la ricotta ou le cottage cheese. Faire bouillir le sucre, l’eau et le jus de citron à feu moyen pendant 10 minutes. Ajouter l’eau de rose après avoir coupé le feu. Laisser refroidir complètement. Beurrer et colorer le fond et les côtés d’un moule de 10 pouces (25 cm) de large, et 2 pouces de haut avec 1 cuillère à soupe de beurre fondu et ½ cuillère à café de colorant pour kunafa. Couper la pâte kataifi en 4 morceaux égaux. Ajouter le lait et le beurre tiède. S’assurer qu’il n’y ait pas de gros morceaux et que le kataifi soit délié. Mettre les ⅔ du kataifi dans le moule. Presser sur le fond et les côtés du moule. Mettre tout le fromage. Égaliser la surface et presser. Couvrir avec le ⅓ restant du kataifi. Presser avec les paumes de la main ou avec une spatule. Cuire 40 minutes dans un four préchauffé à 350°F/177°C. Laisser refroidir le kunafa 10 minutes avant de le retourner dans un grand plat ou un présentoir à gâteau. Décorer avec de la pistache moulue. Vous pouvez verser le sirop sur le gâteau entier ou sur chaque part individuelle. 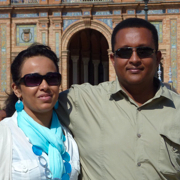 Walaasheenna qaaliga ah, aad iyo aad ayaa u mahadsan tahay. Waan ku faraxnay faalladaada. Nala socodsii markaad samaysatid. Qayr badan ayaan Ilaahay kaaga baryaynaa. Adigaa mahadda mudan, walaasheenna qaaliga ah. Waan ku faraxsan nahay inaad ka faa’iidaysanaysid goobta Xawaash. Qayr ayaan kuu rajaynaynaa. salam a&l long time, late ramalan kareem and eid mubrak sorry.very busy.running chicken with out head.lots of responsibility ,college,work,marrige finding the right girl 4 me, still looking.etc,etc. anyway hows the family.tell every 1 salam.all these recipes are great..the kunafa can you show us some savoury kunafa please thankyou. Welcome back, dear friend! Thank you very much for the greetings. We are happy you like the Kunafa. ameen, yarabal aalameen.thankyou 4 everything.love u guys n ur cooking catch u later gater bye. You don’t need to desalt mozzarella. You can use the shredded one, but the fresh one is better. We don’t like to pour the syrup on the top incase we have some left over, but if you are consuming all of it you can pour it at once. Thank you very much for your kind words. We wish you all the best. Thank you very much. One more highly successful recipe. Special thanks to you for taking the trouble to explain everything in smooth details. 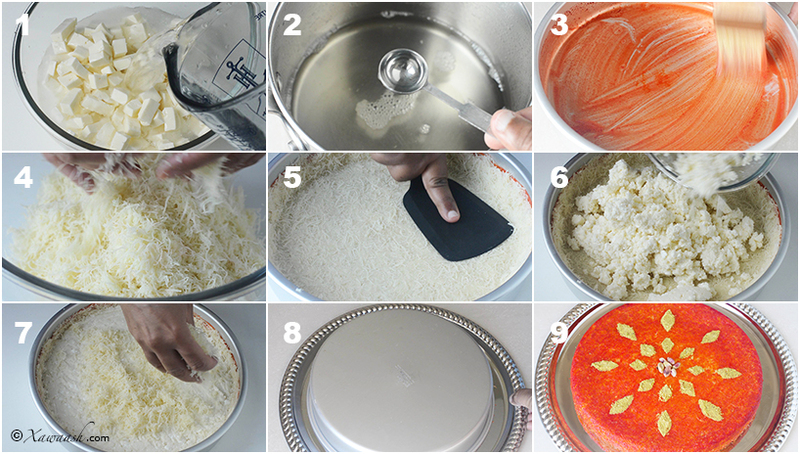 Making Kunafa nabulsiyah used to be a nightmare because of the complicated steps. No more. Keep up the good work and Allah ye’teekum alf afiah. Thank you so much, Mouchira. We were delighted by your wonderful comment, and very happy for your confidence in our recipes. 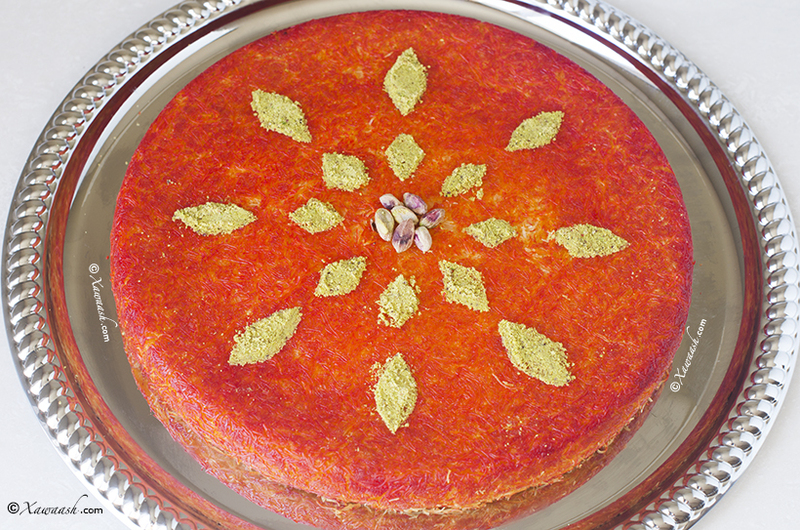 Hi, I have been wanting to make Kunafa and found this wonderful recipe! I bought everything in your page to be able to make it. I was wondering if I but the “sweet cheese” or akawi would I still have to rinse it before using it? And also I have noticed that some Kunafas are orange inside out, instead of just the outside. If I wanted to be completely orange, then how much kunafe coloring do you recommend to mix and how? Thank you for your confidence in our recipe. 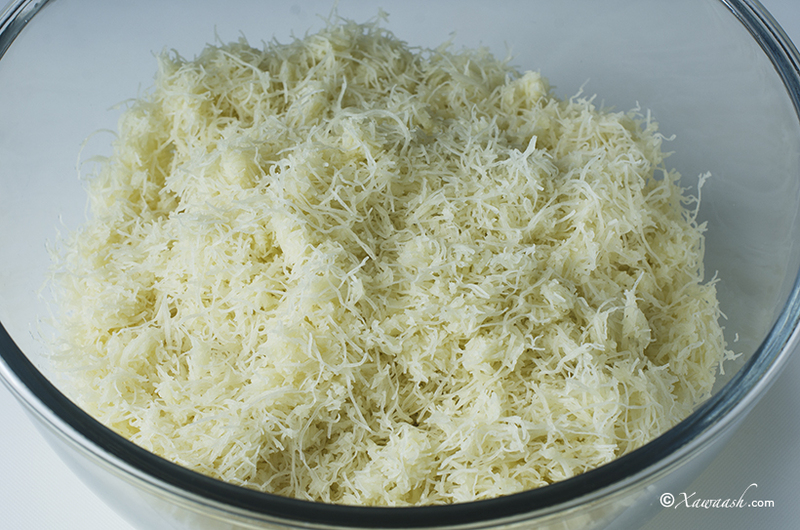 If you are using cheese that is not salty, there is no need to rinse it. 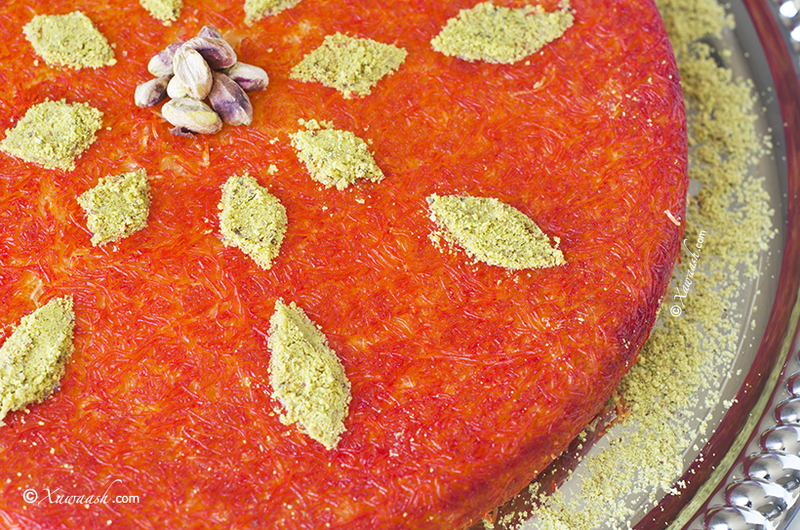 To make it all orange, you can mix another 1/2 teaspoon colour with the milk and then pour it on the Kataifi dough. For a nice contrast, make sure you don’t colour the cheese. Hello. I’ve tried making knafeh couple of times. First time, with mozzarella, which was good, but not the exact taste I remembered of the shop-bought one. Second time, I tried with akkawi cheese, but I didn’t desalt it properly and the final the result was way too salty. Now, I bought unsalted akkawi cheese but I’ve tried and tastes quite simple ! I mean, isn’t it supposed to be slightly salty for the knafeh? Shall I add a bit of salt to it? What do you think? 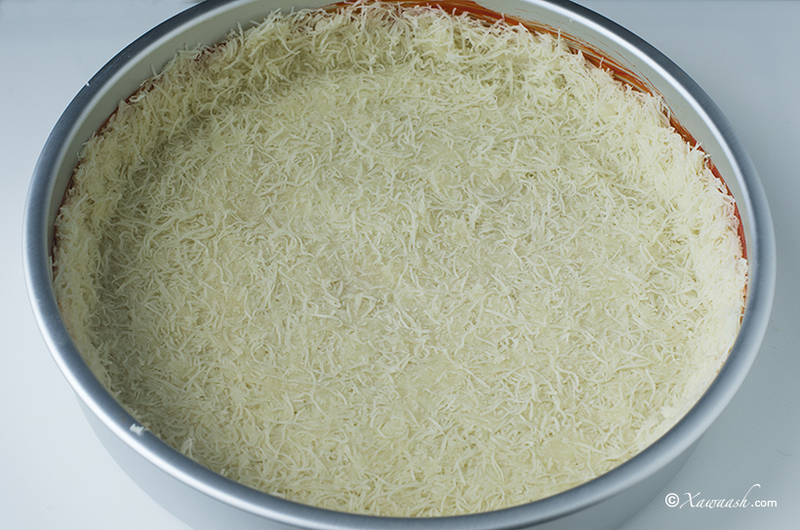 Traditionally no salt is added to Kunafa, but if you wish you can add a pinch of salt. You have the best website ever when it comes to food recipes! I am stunned! You take so beautiful pictures, your texts are easy to understand, and everything looks so tasty! Keep up the good work, you are doing GREAT! We are delighted to know that you like the website. Thank you very much for your amazing compliment. We really appreciate it. 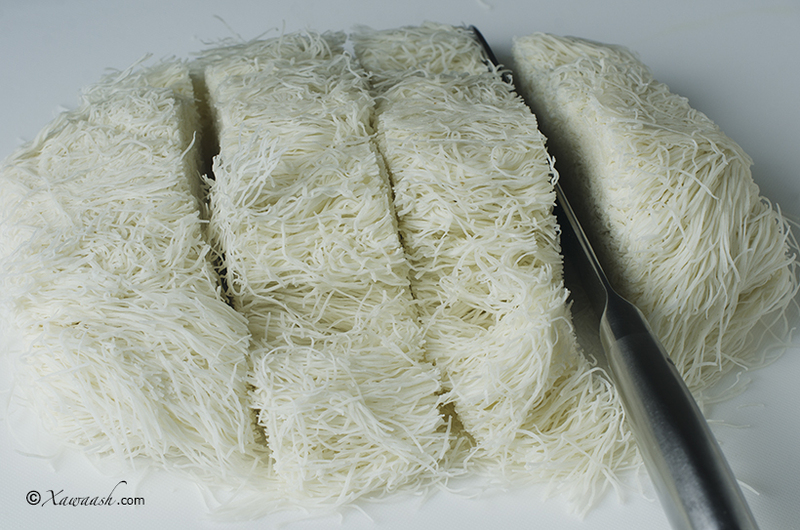 I love kanafa have tried to make it but always flop because of akawi cheese saltiness i soak it over night after that rinse that cheese may be 6 to 7 times still i feel salty how shall i reduce saltiness in my akawi cheese. Please help thank you for your kind help and support. I am currently doing this recipe as I type. So far so good! cant wait to try it!my question is how to I properly store whats left over? Hello! I am so happy to found your website as I was looking for a much easier recipe for this cheese pastry. I tried it last night, followed the recipe precisely. It came out very well. This is my first time to handle a shredded phyllo dough. I would like to ask if this is meant to be served hot or warm like serve just a few minutes after taking out of the oven? My husband is from Syria and I imagine he got the best kunafah growing up, so of course what I did what not so much as he expected. Also, is it supposed to be so brown, like the top dough is almost burned? We couldn’t finish all of it in one eating, do you think the leftover part is not as good as the fresh one? Of course it’s still good to eat, I just want to hear your opinion. And is it supposed to be crunchy? 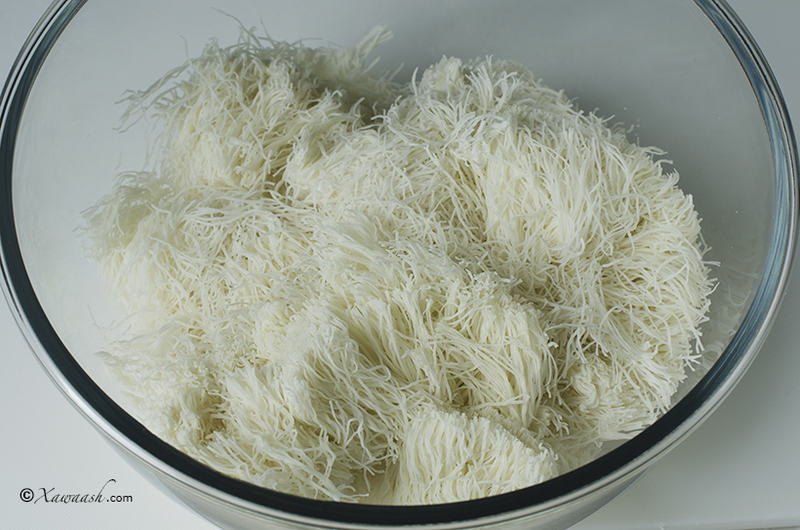 We live in Seattle Washington and it took me a few months to actually fine the shredded phyllo dough so I was so excited when I found it. Anyway, thank you very much! Prep. Is this simply to rehydrate the kataifi?